Terry Cavaretta-St. Jules was the greatest female flyerAn acrobat that is propelled in the air, either in a flying act, or in an acrobatic act (i.e. teeterboard). of her generation, and arguably one of the greatest female flyers of all time. A diminutive, eye-catching woman with a girlish charm and a luminous smile, she was for twenty-three years a headliner in Las Vegas, the star of a flying actAny aerial act in which an acrobat is propelled in the air from one point to another. in which she performed the repertoire of the best male flyers of her generation, including a consistent triple somersault. She was born Darlene Teresa Anne Cavaretta on March 6, 1953 in Buffalo, New York. Her father, Vince, was a cement mason turned drive-in restaurant entrepreneur, whose parents had emigrated from Sicily. Her mother, Anne, was a homemaker. She and Vince had six children: Judy, born in 1945; Candace (Kandy), born in 1946; Jimmy, born in 1949; the twins Maureen (Moe) and Marlene (Molli), born in 1951; and Darlene (Terry), the youngest. In 1956, when Terry was three years old, the family left Buffalo for the balmier climate of St. Petersburg in Florida—a city close to Sarasota, where Ringling Bros. and Barnum & Bailey had kept their winter quarters for thirty years, and in and around which a great number of circus performers had consequently established their home. In St. Petersburg, Kandy, Moe, and Molli joined a circus program run by Faye Moses (who was to marry Hugo Zacchini). Faye had trained in a circus program that existed then at Florida State University in Tallahassee, and she created her own kid program, which she ran over the years in various recreation centers in the area. All the kids in Faye's program participated in an end-of-the-year show. In 1961, trapeze legend Fay Alexander (1924-2000) came to see the kids' performance; eight-year-old Terry was already flying then. Alexander was impressed by the Cavaretta girls, and asked their parents if they could do a few dates with the Flying Alexanders in the summer. Vince accepted, and Terry and Kandy made their professional debut with the Flying Alexanders. They worked dates, and appeared also on the Al Dobritch show. The act was then composed of Fay and Rose Alexander, Bobby Simpson and the catcherIn an acrobatic or a flying act, the person whose role is to catch acrobats that have been propelled in the air. Paul McCausland—to whom Kandy and Terry Cavaretta were added. On top of that, Moe, Molli, Kandy and Terry did single trapeze acts in an aerial display, and Moe and Molli participated in a Spanish web ballet. The following year, in 1962, Terry created a double trapeze act with brother Jimmy. But her experience with Fay Alexander had hooked her up on flying, and the following year, she went to work with the Flying Zacchinis on dates, and again with the Al Dobritch show. Al Dobritch suggested then that the Cavaretta kids do their own flying actAny aerial act in which an acrobat is propelled in the air from one point to another. ; they had the skills and the personality, and a teenager flying actAny aerial act in which an acrobat is propelled in the air from one point to another. with girl flyers only couldn’t fail to attract attention—and it did: The Cavarettas were soon booked for a couple of dates, even though they had no rigging, no costumes and… no act. They managed to build their flying actAny aerial act in which an acrobat is propelled in the air from one point to another. 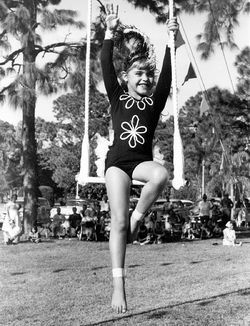 in two-and-a-half months, practicing daily first at the Zacchinis’ compound in Tampa (where Jimmy, who had never caught a flying trapezeAerial act in which an acrobat is propelled from a trapeze to a catcher, or to another trapeze. (See also: Short-distance Flying Trapeze) act before, had begun his aerial training), and then on the Gaonas’ rig(American) The rigged apparatus used to perform an aerial act, especially a flying act. in Venice, Florida; although they practiced on two different rigs at the same time, they progressed quickly. 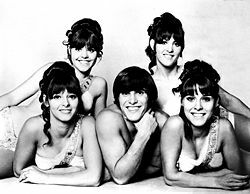 Terry’s mother did the costumes, the Gaonas sold them an old rig(American) The rigged apparatus used to perform an aerial act, especially a flying act., and the act debuted on March 6, 1966 in Toledo, Ohio. It was composed of Kandy, Moe, Molli, and Terry, with Jimmy being the catcherIn an acrobatic or a flying act, the person whose role is to catch acrobats that have been propelled in the air.. They didn’t do truly "big" tricks (although Kandy did a somersault-and-a-half caught by the legs, and Terry by now caught a double in the hands of Jimmy), but they were teenagers with an all-girl flying cast, and that indeed was enough to make their act unique. 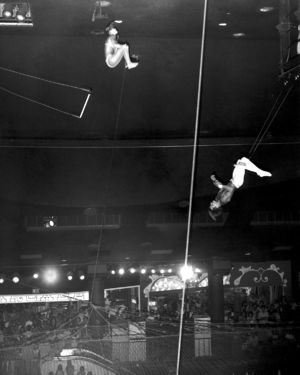 The Flying Cavarettas were a success, and Terry, whose idol was and remained Fay Alexander, was intent on turning the triple somersault, as Fay did. The Cavarettas improved their repertoire on dares: "If you do a double, I will do a triple! "—and whatever it was, they went for it. It was not that simple, however, and they learned the hard way, by trials and errors. As for Terry, she was practicing triple somersaults to the net, dreaming she was Fay Alexander. She also tried to catch some with Jimmy, going fearlessly for it, and getting caught by her legs, her hair, or whatever Jimmy could grab coming his way! Finally, during an engagement with Polack Bros. Circus in 1966, Terry caught her first triple in Jimmy’s hands. She was thirteen years old. She was not consistent yet, but she was on the right path. Terry was the third woman ever to have caught the triple somersault, after Antoinette Concello (1905-1984), and Lena Jordan, of the Flying Jordans. The latter was apparently the first aerial triple-somersaulter in history: She completed her first triple probably in 1896 in New York (at Koster & Bial’s Theater), and was seen turning it in 1897 in Australia—although it is not sure that it was on the flying trapezeAerial act in which an acrobat is propelled from a trapeze to a catcher, or to another trapeze. (See also: Short-distance Flying Trapeze) (it could have been from catcherIn an acrobatic or a flying act, the person whose role is to catch acrobats that have been propelled in the air. to catcherIn an acrobatic or a flying act, the person whose role is to catch acrobats that have been propelled in the air.). Like Terry, Lena Jordan was a teenager when she completed her first triple. As for Antoinette Concello, she had turned the triple on a very few occasions, and was not consistent. Al Dobritch was a friend of Jay Sarno, the hotel entrepreneur who had created the Caesars Palace hotel and casino, the first themed casino to open in Las Vegas. In 1968, Sarno opened a new themed hotel and casino, Circus Circus, whose main attraction(Russian) A circus act that can occupy up to the entire second half of a circus performance. was a non-stop circus show involving top circus acts. Dobritch provided acts for Sarno, and he offered him the Flying Cavarettas, with its glamorous all-female flying team and its pretty triple-somersaulter, Terry Cavaretta. The Flying Cavarettas debuted in Las Vegas on Circus Circus’s opening day, October 18, 1968. Terry would remain a Circus Circus flying star for twenty-three years. Working steadily in the same place without having to adjust constantly to the technical problems presented by ever-changing locales, she was soon able to bring consistency to her triple somersault—a feat that actually just a few male flyers could truly claim at that time. As a matter of fact, Terry was the first woman ever to do a consistent triple somersault on the flying trapezeAerial act in which an acrobat is propelled from a trapeze to a catcher, or to another trapeze. (See also: Short-distance Flying Trapeze), and one of the few flyers (male or female) to do so at the time. All this was in the era before Las Vegas became the world capital of faceless corporate entertainment: Its casinos were still operating under the much more liberal and colorful aegis of the Mafia—and entertainment directors still paid attention to top visual entertainers, which were treated as individuals whose very personality and talent could be a box office draw: Terry’s first contract included bonuses and a car lease! The composition of the act changed over the years. Kandy married the producer Jerry Schafer and left the act after three months only in Las Vegas (she would eventually return). Then Maureen married Barry Mitchell, of the Flying Medallions, who were also featured at Circus Circus. As for Terry, she married in 1971 Roland (Ron) Eloy Lemus, who had been the catcherIn an acrobatic or a flying act, the person whose role is to catch acrobats that have been propelled in the air. of another flying trapezeAerial act in which an acrobat is propelled from a trapeze to a catcher, or to another trapeze. (See also: Short-distance Flying Trapeze) legend, Bob Yerkes, and of The Palacios. Ron Lemus became the catcherIn an acrobatic or a flying act, the person whose role is to catch acrobats that have been propelled in the air. of the Cavarettas in 1973, while Jimmy went on with the Flying Medallions. In 1974, Jimmy Cavaretta left Circus Circus and went with the Medallions to Ringling Bros. and Barnum & Bailey. The Flying Medallions act consisted then of Barry Mitchell, Maureen Cavaretta-Mitchell, and Jimmy Cavaretta with his first wife, Judy Calvin. Jimmy would stay with the Medallions until 1976. Ron Lemus and Terry renamed their act The Flying Terrels—a contraction of Terry and Eloy—and under that name, Terry’s act would gain considerable fame in Europe and Australasia. During their Circus Circus breaks, the Flying Terrels began to get engagements in Europe. The first had been at Copenhagen’s Tivoli Gardens in the summer of 1973. In 1975, they participated in the Billy Smart’s Christmas Spectacular, a popular Christmas television show presented by the BBC, and filmed under the giant big topThe circus tent. America: The main tent of a traveling circus, where the show is performed, as opposed to the other tops. (French, Russian: Chapiteau) of Billy Smart’s Circus. They also appeared in one of Joe Cates’s American TV circus shows for NBC, shot at Paris’s legendary Cirque d’Hiver. Terry’s usual repertoire included a double layout, a double cut-away half with a pirouette(French) A full rotation of the body in the vertical axle. Double pirouette: two rotations, etc. return, and the triple. On March 12, 1976, during an outdoor practice session, she caught a triple and a half in Ron’s arms, which was recorded on camera by Sandy Dobritch. The triple and a half never made it into performance, but that same year, Terry entered the Guinness Book of World Records as the only woman to perform a consistent triple somersault on the flying trapezeAerial act in which an acrobat is propelled from a trapeze to a catcher, or to another trapeze. (See also: Short-distance Flying Trapeze). Then tragedy struck. On September 24, 1976, Ron was flying with Mike McCardell, Judy’s brother-in-law. Both were confirmed pilots and enjoyed stunt flying. Mike was on the commands when their plane accidentally lost power in a nosedive. The plane crashed, and Ron Lemus and Mike McCardell were killed in the accident. Jimmy returned to Las Vegas to be with his sister and replace Ron in the Flying Terrels’ act. Moe returned as well. In 1977, the Terrels went on a fourteen-week tour of Australasia with an all-star international cast gathered by Australian producer Michael Edgley, for a show he titled The Greatest Circus On Earth. The Terrels shared the bill with such circus luminaries as the legendary acrobat on the Golden Bicycle, Lilly Yokoi, the juggler Rudy Schweitzer, the sword balancer Rogana, and the spectacular teeterboardA seesaw made of wood, or fiberglass poles tied together, which is used to propel acrobats in the air. act of the Boichanovi, then at the peak of their form. Back to the United States, the Terrels resumed their engagement at Circus Circus. They returned to London the following year to defend their title in the Circus World Championships, and in the winter of 1979, they were featured in the Christmas circus spectacular, Menschen-Tiere-Sensationen, at the Deutschlandhalle in Berlin. Then, the Flying Terrels reverted to their old name, the Flying Cavarettas. In 1982, they had been booked to participate in the International Circus Festival of Monte Carlo, but the sudden death of Princess Grace of Monaco in a car accident resulted in the cancellation of the Festival. Instead, the Cavarettas participated in a big circus show in Montreal, Canada, where Terry met the juggler Réjean St. Jules. They were married in 1983, and Réjean would make his own mark in Las Vegas, where he was featured in major shows for the following three decades. Everything comes to an end however, and the Flying Cavarettas finally dissolved their act in 1991. Terry was thirty-eight, but it was not retirement time yet: Jimmy and her revived their old double trapeze act (considerably improved by then! ), which they performed at the Tropicana in Las Vegas for another four years. Terry was forty-seven when she got pregnant with her son, Sebastian St. Jules, who was born in 2001 (and would become, like his father, a remarkable juggler). In 2012, Terry created Terry Cavaretta Trapeze Experience, a flying trapezeAerial act in which an acrobat is propelled from a trapeze to a catcher, or to another trapeze. (See also: Short-distance Flying Trapeze) school in Las Vegas. In 2014, Terry was inducted into the International Circus Hall Of Fame in Peru, Indiana. Flying trapeze keeps you fit: after all these years, Terry never lost her youthful and attractive looks and her radiant smile, and she still flies occasionally—and she still is indeed one of the greatest women who ever did so.